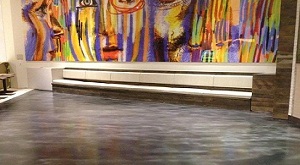 Flooring systems in restaurants and hospitality facilities demand special attention. These concrete floor coatings must be exceptionally durable, easy to clean, safe and skid-resistant—all while offering updated decor and design flexibility. The hospitality and restaurant flooring systems at Florock do all of this and more, making them ideal for commercial facilities of all types. Custom colors and blends—our specialty! The style of your concrete epoxy floor coatings for hospitality industry facilities can help you redefine a space. From restaurants and hotels to casinos, resorts, theaters, and other venues, the right flooring system can showcase dramatically expansive architecture, create a homey feeling in a cozy corner, welcome visitors with company floor logos or even direct traffic in public walkways. Concrete epoxy floor coatings for hospitality employ colored chips, colored quartz blends, or metallic powders that can add interest, texture, color and patterns to areas accessible to facility guests. We have the flooring formulas to easily maintain finishes that resist stains, chemical damage and heavy foot-traffic, keeping your flooring looking great for longer. Commercial kitchens, laundry rooms, locker rooms, mechanical spaces and more are all critical areas in the back of the house. Because these locations can easily become wet and slippery, your floor finish must be skid-resistant. We balance the ideal slip-resistance with distinct cleanability, making it easier to maintain a safe workspace for your staff. We offer antimicrobial finishes that meet USDA requirements, floor-to-wall cove bases, concrete floors that slope to drains and finishes that hold up under repeated steam and power-washing. 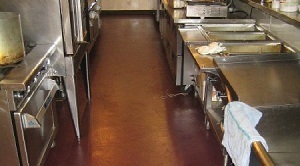 Concrete epoxy floor coatings for hospitality must be resistant to harsh disinfectants and industrial cleaning solutions, while floors in walk-in freezers and coolers may be subjected to temperature cycling and thermal shock when defrosted or sanitized. With so many requirements, finding the right restaurant and hospitality flooring systems for the different areas of your facility can be a challenge. With Florock, you can relax—our local technical representatives and approved installers are there to help.